The UK announced  last week that construction will soon begin on the first vessel of the Successor-class—the Royal Navy’s controversial  new nuclear ballistic missile submarines. The Royal Navy awarded BAE Systems over £1.3 billion (AU$2.12 billion) to begin work on the vessel’s auxiliary machine space module , which houses electrical components for the ship’s nuclear reactor. The UK tabloid press is outraged  that—sacré bleu!—the subs will be built using French steel. That announcement comes on the heels of the US Navy awarding a US$101.3 million contract to General Dynamics Electric Boat for the first 22 missiles tubes  of the US-UK Common Missile Compartment. The missile tubes will eventually be installed on both the Successor-class and the USN’s upcoming Columbia-class  nuclear ballistic missile submarines. In interesting news for Australia, the Italian Navy received its final anti-submarine warfare variant of the FREMM frigate  last week. Fincantieri, the Italian manufacturer of the ships, has proposed an ‘Australianised’ variant  for the Royal Australian Navy’s SEA 5000 program to replace its ANZAC frigates. The USN’s recent changes to its 241-year-old rating system (mentioned last week ) have received harsh  criticism  from affected Navy personnel. Navy commanders have tried to downplay  the changes, with Chief of Naval Operations Admiral John Richardson calling on sailors to focus on plans to make more job fields and skills experience available. The Japanese Ministry of Defence has released plans for the development of a new highly manoeuvrable stealth drone, the Combat Support Unmanned Aircraft . The Japanese Air Self-Defense Force wants to link multiple UAVs with their F-3 stealth fighter—due for service in 2027—and a high-altitude ballistic missile defence (BMD) aircraft. Both the F-3 and the BMD would act as mobile command centres for the drones, which would carry payloads to enhance their missions. Indian Prime Minister Narendra Modi is planning to sign to number of big-ticket deals  with Russian President Vladimir Putin at the India–Russia annual summit in Goa this weekend. 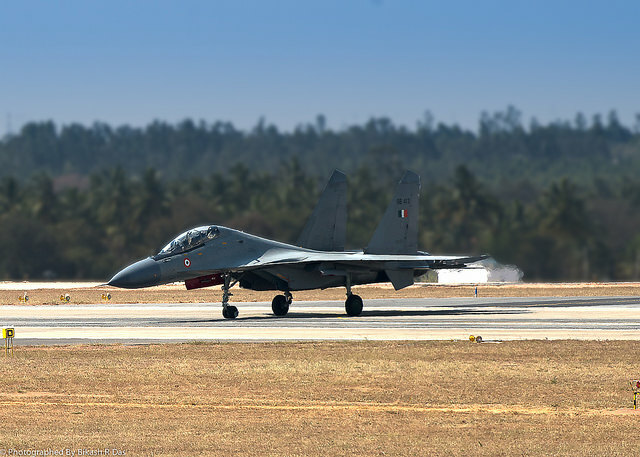 The fast-tracked acquisitions include 40 upgraded Su-30MKI Flankers  and 10 Kamov-28 helicopters . Joint endeavours to produce Kamov-226 choppers and fifth generation fighter aircraft may also be finalised.. Remember that CIA RQ-170 stealth UAV that crashed in Iran  in 2011? It appears that Iran has developed two new types of UAVs  using design aspects from the RQ-170. Scepticism  is rife regarding the Iranian UAVs’ actual capabilities, however IHS Jane’s is reporting that the aircraft are based at an airport in Kashan , which suggests some sort of operational capability. Russia’s sent an S-300 air defence missile system to its naval base in Syria . The SA-23 Gladiator anti-missile and anti-aircraft system has a range of 150 miles and can fire two different types of missiles —a smaller 9M83ME missile to counter aircraft, cruise and small ballistic missiles and a larger 9M82ME missile for intermediate-range ballistic missiles—each containing 150 kilograms of explosives . This is the first time Russia has deployed an advanced air defence system in Syria, raising questions in the West regarding the motivation for the move—Russia’s stated objective in Syria is to counter extremist groups, none of whom have aircraft. Defense Ministry Spokesman Igor Konashenkov defended the move  as ‘purely defensive’, while Foreign Minister Maria Zakharova claimed the move was a response leaked data on US  plans to hit Syrian airbases. General Motors is working with the US Army to develop a hydrogen-powered vehicle . Unveiled on 3 October, the three-tonne pickup truck is modelled on the Chevrolet Colorado ZH2, and is 2 metres tall and 2.1 metres wide. In addition to zero emissions and the silent-running capability, the truck’s advantages  include cooler running temperatures, making it difficult for thermal cameras to detect, and a faster refuelling time. It will undergo infield testing in early 2017. Rekindled Russia–India defence relations will see India acquire five S-400 ‘Triumf’ long-range air defence missile systems . The acquisition (along with the other deals ) will bolster India’s air defence system, providing it with a significant capability edge over neighbouring Pakistan. The program leader for the National Space Development Program, Dr Rogel Mari Sese, has made the case  for a national space agency in the Philippines. Citing the use of satellites in agriculture and the military, Sese argues that the cost of outsourcing the Philippines’ space needs is greater than establishing indigenous space infrastructure. Legislators believe an agency could be established by 2017 or 2018. In the realm of space, being first means a lot. So it’s no coincidence that Boeing CEO Dennis Muilenberg announced that a Boeing rocket will be the first to reach Mars . Speaking at the What’s Next? Tech Summit in Chicago, Muilenberg also outlined plans  for hypersonic air travel and a heavy-lift rocket for deep space exploration. On the other side of the Pacific, China’s private space industry’s looking to compete against its US counterparts in the commercial space sector . Chinese company Kuaizhou is building the KZ-11 rocket for a launch cost of a relatively cost efficient US$10,000 per kilogram, while the Kuangchi group and CALT are designing multiple-use rockets and modular spacecraft, rather than opting for the re-usable models their US counterparts are developing. It’s expected those spaceships will be involved in space tourism missions and the launch of commercial payloads. Christopher Cowan, Thulasi Wigneswaran, Elisabeth Buchan, and Alexander Vipond are research interns at ASPI. Image courtesy of Flickr user Bikash Das.